When the first volume of A Series of Plays appeared in 1798, it caused a stir. Who was the author of this striking work? Some thought it must be the leading writer of the day, Walter Scott. 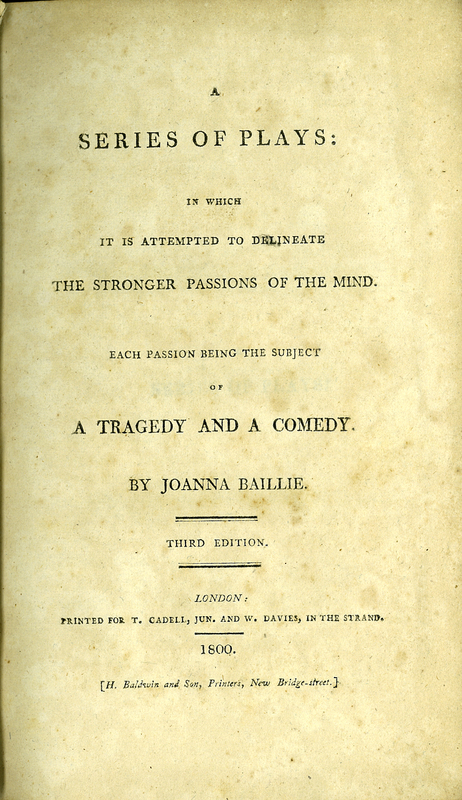 The author was revealed in the third edition as Joanna Baillie (1762-1851), a niece of John and William Hunter. While her uncles and brother Matthew explored human anatomy, Joanna explored the varieties of human passions. Joanna Baillie, “A Series of Plays. Volume I,” ourheritage.ac.nz | OUR Heritage, accessed April 26, 2019, http://ourheritage.ac.nz/items/show/10164.